In the late 1980s, the digital graphics studio where I worked in LA did an incredible thing: they bought a stat cam. I thought it was the last thing we needed, we were an all-digital studio, we had high end drum scanners and Agfa imagesetters. Stat cams were such a pain to use, that’s why everyone was switching to digital. So I wondered why the boss wanted such an expensive but obsolete device like this. Our company never bought anything but the high end machines. 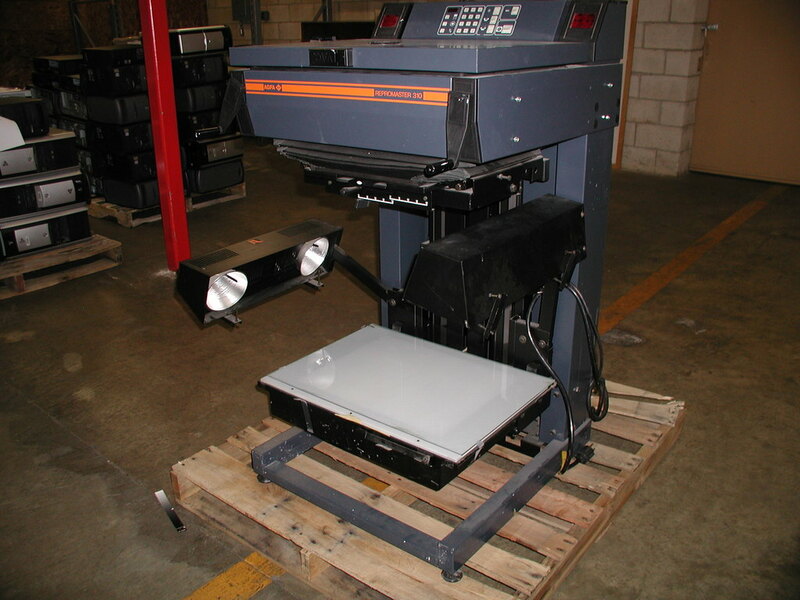 Even today, a used top-end Agfa Repromaster stat camera can cost thousands of dollars. I found this picture on a University surplus auction site, starting bid $50. What a deal. Static Cameras were the standard for graphic arts production for decades. Designers would paste their graphics and type onto a white paper sheet; the stat cam would photograph it and convert it to a film used to make printing plates. The films could be as large as two newspaper sheets, the typical paper size of high speed printing presses. I’ve done some amazing things on stat cams, even back in the early 1970s. The boss said he bought the camera for the old-school printing guys we hired. They assured him they had clients with enough stat cam work to pay for it in mere months. I didn’t see how that was possible. Studios that ran stat cams were going out of business because they were losing their customers (and employees) to digital production companies like us. There were thousands of graphics studios with stat cams that were desperate for work. The Repromaster reached the pinnacle of analog film production just as the analog process became obsolete. The lenses were superb, the quality of the films it produced were perfect. Faster and more elaborate electronic controls would be useless. This was the last stat camera anyone would ever need. We didn’t even need one. We never had one single customer for the stat cam. Agfa stopped making the Repromaster years ago. They are antiques, today you can find them in the Museum of Forgotten Art Supplies. Stat cams were designed for only one job, to make perfect film reproductions of flat artwork. If you wanted to do this job today, you would use a digital camera on a copy stand. I just built one, almost by accident. But I will write about that in my next post. Enjoyed your article it was a look into my past as a production artist. Waxing and pasting retail ads and then shooting stats for about 35 newspapers. I was very efficient at it, but boy did I love it when we went digital. Did not miss dealing with all the chemicals it took to process the film.